In my first Kitchen Gadgets 101 post I mentioned purchasing a Lékué macaron kit and that I would let you know how successful (or not) I would be using it. I am happy to report that results were in my favour!! These lovely little desserts can be a challenge, maybe a little daunting but they are a real delight to eat and look very impressive when you present them as a gift. There are many uncontrollable factors that come into play; the freshness of your almonds, the humidity in the air, how you mix your meringue, how well you do the macaronnage part, the type of pans you use, how hot your oven is. Again, don’t let any of those factors scare you from trying to make them. I usually get very lucky when I try a recipe for the first time. Duplicating my first results is usually where I have more problems. I have to admit that I cook more intuitively than precisely and baking is an exercise in precision. Depending on the recipe, it is a real science, a chemical reaction in some cases that needs very specific measurements to be successful. My first attempt was a huge success and my work colleagues all gave positive reviews. Thank you all. When I was baking my first batch of macarons, I realized that I only had one baking sheet and that was after I had made the batter and poured the macaron tops. Uh oh, now I have to adjust the time or temperature during baking and be very watchful especially near the end of the baking time to make sure they don’t burn. I was positive that I had 2 baking sheets but apparently not. Note to file: Check to make sure you have ALL of the equipment and ingredients you need BEFORE you start a recipe. almost ready for the oven..
During the baking of my first batch, about half way through the process, I heard a loud POING!! Oh, noooo! The baking sheet suddenly warped as it heated up in the oven. This is a very common occurrence as thinner sheets will do this but now I had visions of my perfectly shaped macaron tops spattered inside my oven. Fortunately they were not but that was the deciding factor to purchase more sturdy baking sheets before I make another batch (a colleague asked if I would make some for a dinner party this weekend). I tried some with my silicone macaron pad and a few on parchment paper. I have to say that although the ones baked on the silicone pad were slightly overcooked on the bottom (probably because I only had one baking sheet and you need to stack 2 together); the ones on parchment paper were completely overcooked, scorched actually. My garbage bin enjoyed that batch. To my delight the “pied” or “foot” formed perfectly while the macaron caps were cooking. First time lucky?? I certainly hope not. With the successful reviews from my first batch of macarons, I am on my way to my favourite kitchen supply store Placewares, and on the hunt for new baking sheets. After a bit of research, I decided to purchase 2 reinforced aluminium trays. Bright and shiny new additions to my kitchen, at only $17 each, these ones have a wire inside the rim for extra reinforcement and did not make a sound when I baked with them. Now I will be on the hunt for the best priced liners so they don’t get stained quickly and make clean-up a breeze. 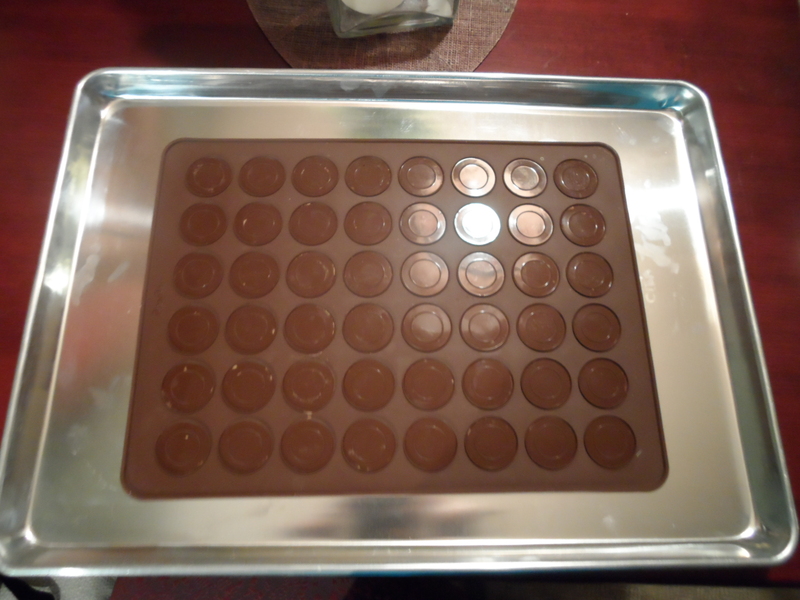 If you do not have a macaron silicone mat like I was lucky to find, you can line a cookie sheet with a sheet of parchment paper (or other non-stick liner like a Silpat). Draw 1 inch (2.5 cm) circles on the paper making sure they are at least ½ inch (1.5 cm) apart. This will be your guide for pouring your batter. Put your almonds and powdered sugar in a food processor and grind to a fine powder. Sift twice through a fine mesh, making sure there are no lumps, and set aside. NOTE: This is where you will notice if your almonds are fresh or not. If you have what will look like large grains in the bottom of the mesh then chances are your almonds are no longer fresh and will give your macarons a grainy texture (this happened to me on my second batch). In a stainless steel mixing bowl, beat egg whites on high speed until they are foamy. Gradually add the granulated sugar to the egg white 1 tablespoon at a time. Scrape the sides of the bowl with a rubber scraper each time before you add another tablespoon of sugar. This will ensure that all of the sugar is incorporated into the egg whites. Add the vanilla extract (or seeds from your vanilla bean). 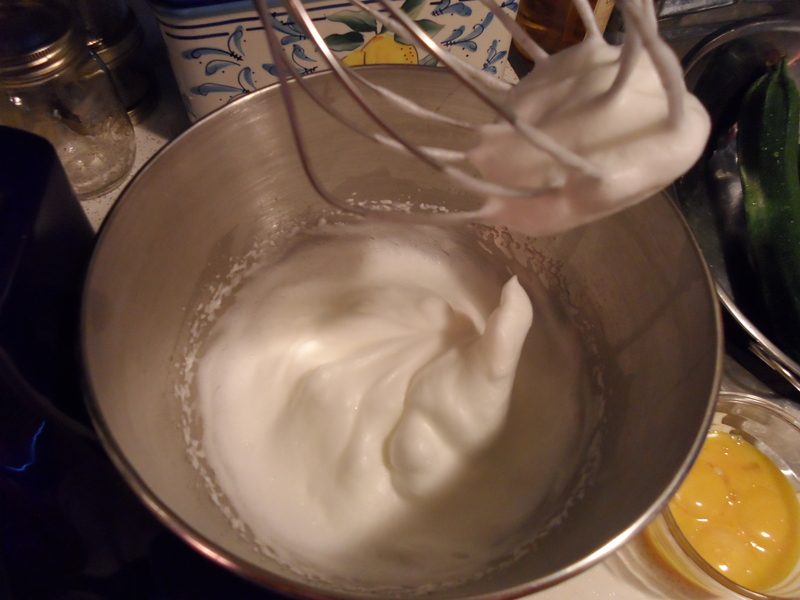 When the meringue is glossy and has stiff, firm peaks it is done. Add half of the sifted sugar/almond mixture and stir into meringue. NOTE: mixing dry ingredients into meringue can be tricky. Do the following technique slowly and gently so as not to deflate your meringue: Take your spatula, cut down the centre of your meringue to the bottom of the bowl, scrape the bottom of the bowl and scoop up the meringue and some of your dry ingredients. Keep repeating this motion slowly until the dry ingredients are incorporated into the meringue. Repeat with second half of sifted sugar/almond mixture until all of the dry ingredients are incorporated into the meringue. Macaronnage Stage: When all of your sugar/almond mixture has been mixed together, using a rubber spatula or scraper, press and spread the batter against the inside of the bowl. 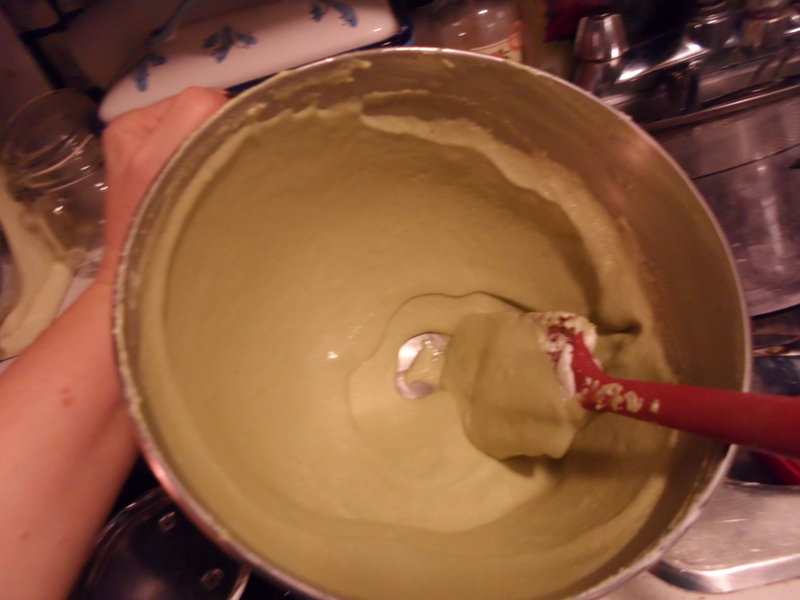 You will be scooping up the batter from the bottom of the bowl, turning it over and smearing it against the inside of the bowl. Repeat this at least 15 times. NOTE: If this step is repeated less than 10 times, your macarons will lack lustre. If you repeat this step more than 20 times you may have oil stains on the surface of your pastry when the macarons are baked. The mixture is ready when the batter becomes firm and drips slowly as you scoop it with a spatula. Attach a 0.4 inch (1.01 cm) tip to a pastry bag. Twist the bag to hold the tip tightly. This will prevent batter from leaking out. Place the pastry bag, tip down, inside a deep measuring cup or large glass and pour the batter in. Clip the top of the bag or twist the bag to prevent batter from leaking out. You can also use a rubber band or some string to tie the top of the bag closed. Or, you can pour the batter into your handy dandy Lékué dispenser. Note: Almost all of the batter from this recipe will fit in the dispenser. Place your sheet used in step 1 on a baking sheet and squeeze out the batter onto the centre of the circles. Make small circles since the batter tends to spread out a bit. I squeezed slowly to a count of 2. When your sheet has been filled, rap the sheet firmly a couple times against the counter or other flat surface. This will pop any tiny bubbles and help the macarons hold their rounded shape. It also helps to form the “pied” or little ruffled “foot”. NOTE: A small pleat-like frill will form at the bottom of your macaron as you bake your macarons. 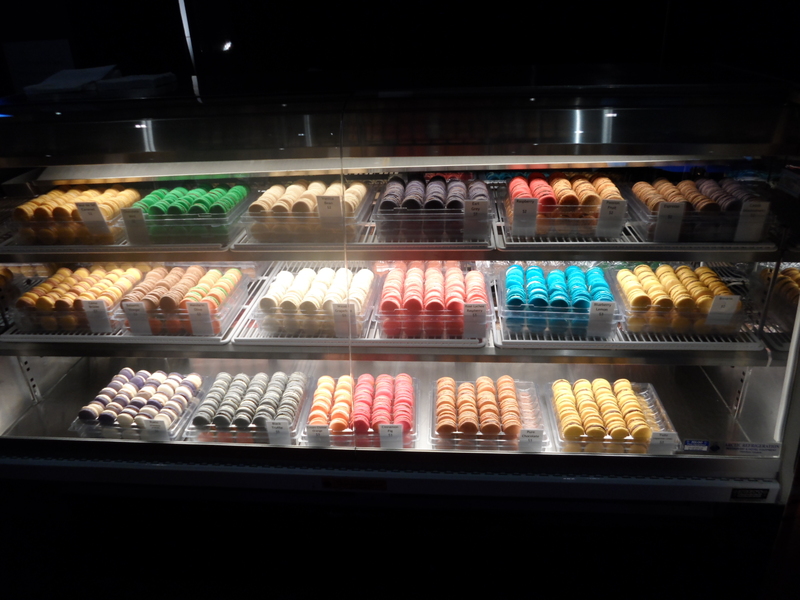 The pastry cannot be called a macaron if this does not occur. There is a great debate on what helps the pied to form: the macaronnage, the oven temperature, banging the baking sheet… I say all three and you can add drying time as well as air quality. Dry the batter uncovered at room temperature for 15 to 20 minutes. A slight crust should form. On rainy days, drying time can be helped if you use a dehumidifier in the room. When the batter circles are not sticky to the touch, the drying process is complete. This can sometimes take up to 30 minutes. NOTE: the batter is settled when there are no tips on the tops of the circles. Place oven rack in centre of the oven and preheat your oven to 375˚F (190˚ Celsius). Stack your baking sheet with your batter circles into another empty baking sheet and slide both into the oven. NOTE: Using two trays, one inside the other, prevents the bottom of the macarons from getting over baked and the tops from puffing up too much and cracking. Bake for 15 to 18 minutes until crisp. To bake macarons evenly, rotate your pan half way through the baking time (approximately 7-8 minutes). This is especially important if you have a hot spot in your oven. Mine is in the back left hand corner and will always scorch whatever is in the top left hand side of a baking pan. If the insides of the macarons are still soft after 15 minutes, lower the oven temperature to 300˚F (150˚ Celsius), cover the tray with aluminium foil and bake for another 2 or 3 minutes. Once the macarons are done, remove the baking sheet from the oven and cool on a wire rack. If you feel confident, gently slide the silicone mat or parchment paper with the macaron tops onto a wire rack. When the macarons are completely cooled, remove them from the mat/parchment paper/cooking sheet. 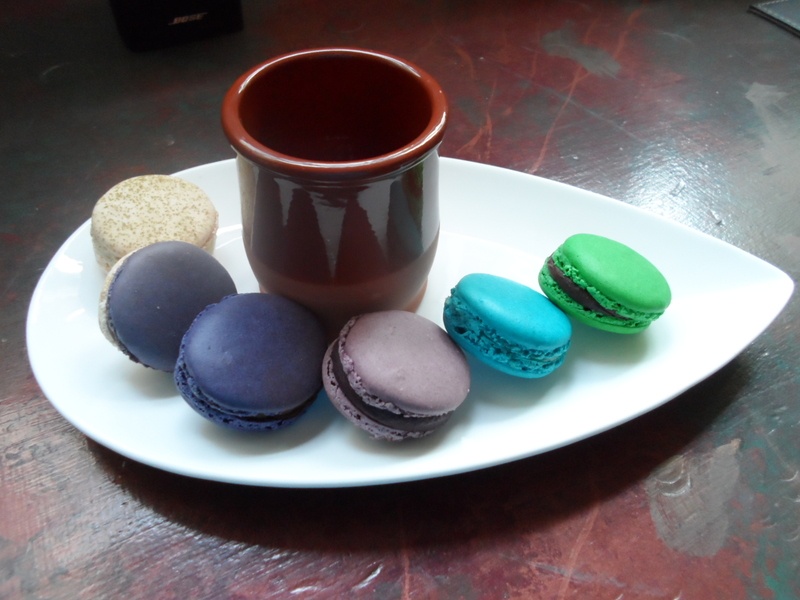 Pipe or spread your favourite filling on one of the macaron shells and top with a second shell. Do not spread your filling right to the edges of you macaron tops as the filling will squish to the edges when you press the two tops together. Be GENTLE! NOTE: If you feel that your macarons are too dry, don’t worry. Put them in the refrigerator, after you have assembled them with the filling, in a sealed container for 24-48 hours and the filling will help to make them chewy. That happened to me on my second batch. Macarons are much better the second day as it gives the flavours time to develop. They can be kept up to one week in a sealed container inside the refrigerator … but they won’t stay uneaten for that long!! Pour cream in a pot and bring to a boil. Cool the mixture to room temperature and put in an airtight container. Store in the refrigerator. When ready to use, bring up to room temperature to soften. NOTE: This ganache is also a good starting point for making chocolate truffles. I’ll post some of my favourite truffle recipes that are really easy to make and will impress your family and friends during the upcoming holiday season. If you want to add colour to your macarons, add a few drops of food colouring while you are making the meringue and when you add the vanilla extract (before you start mixing in the almonds/powdered sugar). 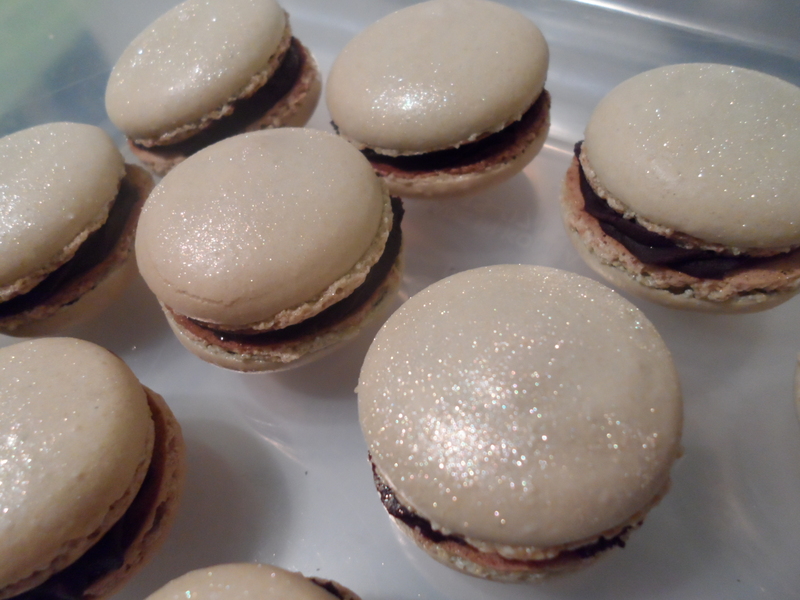 I found some irridescent powder to brush on the tops of the macarons and… voilà! 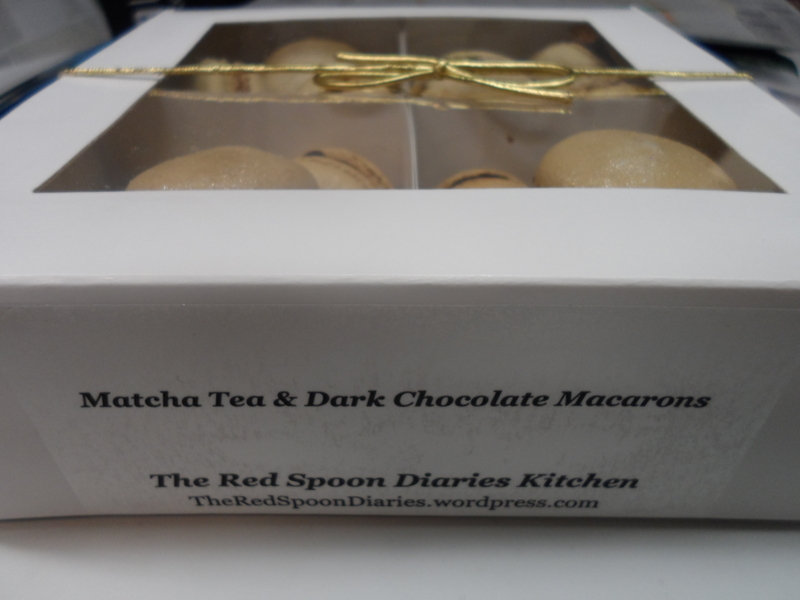 My first gift box of Matcha Tea & Dark Chocolate Ganache Macarons. 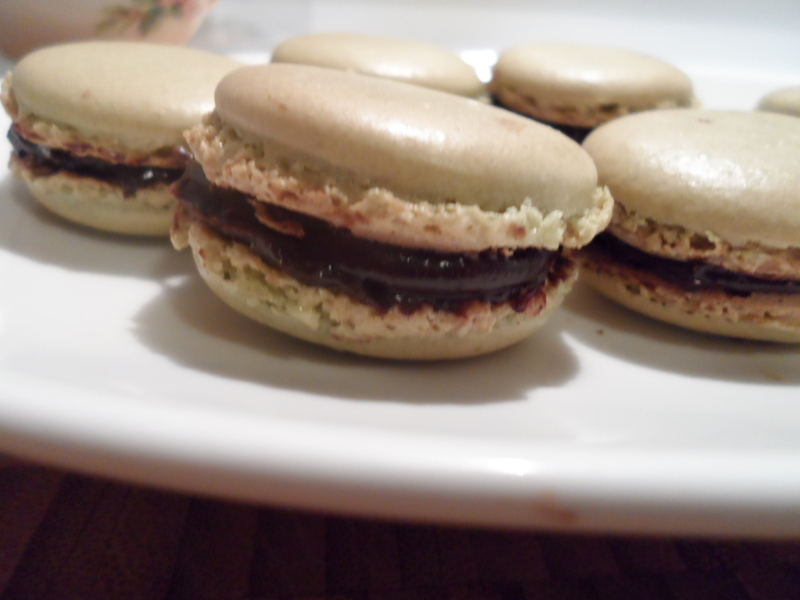 Enjoy some Macarons with me and let me know how yours turn out! Posted in desserts, Macarons, recipesBookmark the permalink.